Welcome to The Law Offices of Jeffrey C. Pettys. My law practice specializes in family based immigration matters and obtaining K1 Fiance Visas, CR1 and IR1 Marriage Visas and Green Cards for the fiances and spouses of US Citizens. Our office has extensive experience working with Filipino fiancés and spouses and has been providing immigration services to the Philippines for many years. Our office has a 100% success rate in obtaining K1 Fiance and CR1 Spousal Visas for Filipinos wishing to immigrate to the United States as a fiance or spouse of a US Citizen. For a general discussion of our firm's immigration services, you are welcome to review and study our main web site at www.marriagevisaservices.com. The information on this page is particular to the Philippines to better assist our Filipino families, friends and clients. 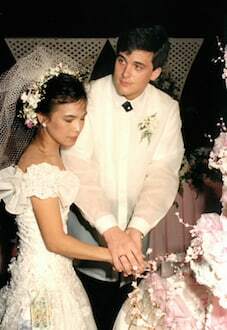 Jeff and Pilar Pettys, Married 2/20/1988 Cebu City, Philippines. I met my Filipino wife while in college. Her name is Pilar Cusi Pettys. We were both students at The Ohio State University. We made the decisions to get married after college and had our wedding in Cebu City. We have been married now for over 27 years! After our wedding, we returned to the United States and started our family. We have two adult boys who are currently in college. Our oldest son, Charley, played soccer for Global FC in Manila and also for the Azkals, the Philippine National Soccer Team. Charley plans to study law and join our family law practice in the near future. Our youngest son, Adam, is currently in college and planning to study law someday too and then join the family business with his brother. Over the course of my marriage to Pilar, our family has visited the Philippines many times to see family and friends. Cebu City is where my wife's family is originally from and it's my favorite place in the Philippines to visit. Cebu City, like all of the Philippines, is a wonderful place with great people. I consider the Philippines to be my second home. I have been blessed to have met such a great person and I wish you the same good luck. What is a K1 Fiance Visa? A K1 Fiance Visa is a type of visa that allows the fiancé of a US Citizen to enter the United States to get married. What are the requirements to apply for a K1 Fiance Visa for my Filipino fiance? You and your fiance intend to get married within 90 days of your fiance's arrival in The United States. How long does it take to get approval of the K1 Fiance Visa Petition and what can I expect after filing my K Visa application? The entire process for obtaining a K1 Fiance Visa takes about 6-7 months from the date that you first file your K1 Fiance Visa application. The application must first be filed with USCIS for approval. This takes about 3 ½ to 4 months. Then once approved by USCIS, your Petition is forwarded to the US Embassy in Manila for continued processing. Once your Petition has been received by the US Embassy in Manila, your Filipino fiance will receive a letter or email from the US Embassy in Manila advising your fiancé as to how to proceed and prepare for their interview. On average, it takes about 2-3 months working with the US Embassy in Manila to meet all the Embassy requirements and then schedule your K1 Fiance Visa interview. Our office will prepare all the necessary forms for you from start to finish. A CR1 Marriage Visa is a type of visa that allows the spouse of a US Citizen or Legal Permanent Resident to enter the United States as a Lawful Permanent Resident. What are the requirements to apply for a CR1 Spousal Visa? How long does it take to get approval of the CR1 Marriage Visa Petition and what can I expect after filing my CR1 Marriage Visa application? The entire process for obtaining a CR1 Marriage Visa takes about 12-14 months from the date that you first file your CR1 Marriage Visa application. The application must first be filed with USCIS for approval. This takes about 3 ½ to 4 months. Then once approved by USCIS, your Petition is forwarded to the National Visa Center (NVC) for continued processing. Once your Petition has been approved by the NVC, your spouse will receive notice of his or her interview date from the US Embassy in Manila. On average, it takes about 8-10 months for the NVC to approve your application and schedule your Embassy interview. For those couples who wish to get married in the Philippines, I highly recommend that you review the legal procedures for Americans getting married in the Philippines. A good source for the legal requirements for Americans to get married in the Philippines can be found at the US Embassy web site for Manila, Philippines. All Filipinos who have been granted a K1 Fiance or CR1/IR1 Immigrant visa are required by the Philippine Government to register with the Commission on Filipinos Overseas before leaving the country to settle in the United States. They are also required to attend an educational seminar about life in a different country. Once the Filipino visa holder has registered with the commission and completed their departure requirements, they will be given a CFO Sticker to be placed in the passport which will be inspected by the Filipino Bureau of Immigration upon departure.